Net, Rake, and Scraper all in one telescoping tool. The Pond Shark is the ultimate 3-in-1 water gardening tool. It includes net, rake and scraper, and has a telescoping steel handle that adjusts to any user and any job. The Pond Shark tears through unwanted pond scum, debris, and string algae and features a sturdy net as well as a tough and durable poly-fiber head. The Pond Shark combines the features of a conventional pond net with a scraper blade and tooth-like tines designed to remove string algae in a simple raking motion. Opposite the rake teeth is the flattened scraper blade, ideal for scraping debris from the bottoms of natural and artificially-lined ponds. The durable, nylon-fiber construction makes the Pond Shark effective, but safe for rubber liners. The hydrodynamic shape of the scraping blade helps the net to move and maneuver more quickly than conventional nets when used to catch fish and other fast moving aquatic creatures. 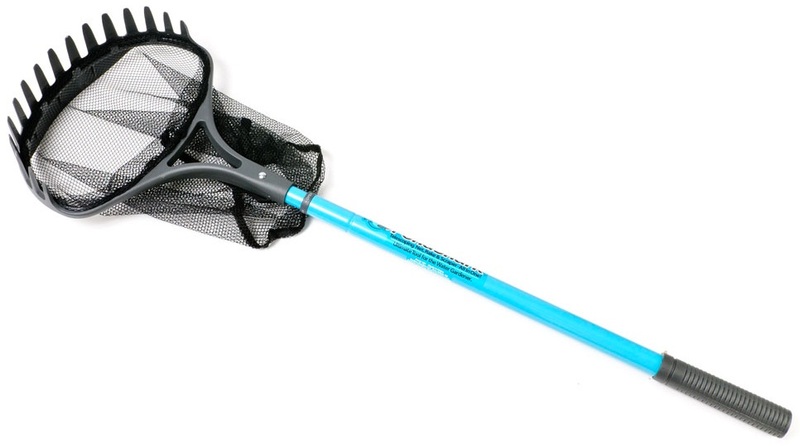 Other unique feature of the Pond Shark are its replaceable, snap-in net and the adjustable, telescoping shaft that locks the tool to any length a user finds appropriate.